Both warm and funny, this is an EARLY EXAMPLE of the Ed Nofziger (1913-2000) creation, Animal Antics which lasted from 1947 to 1961. 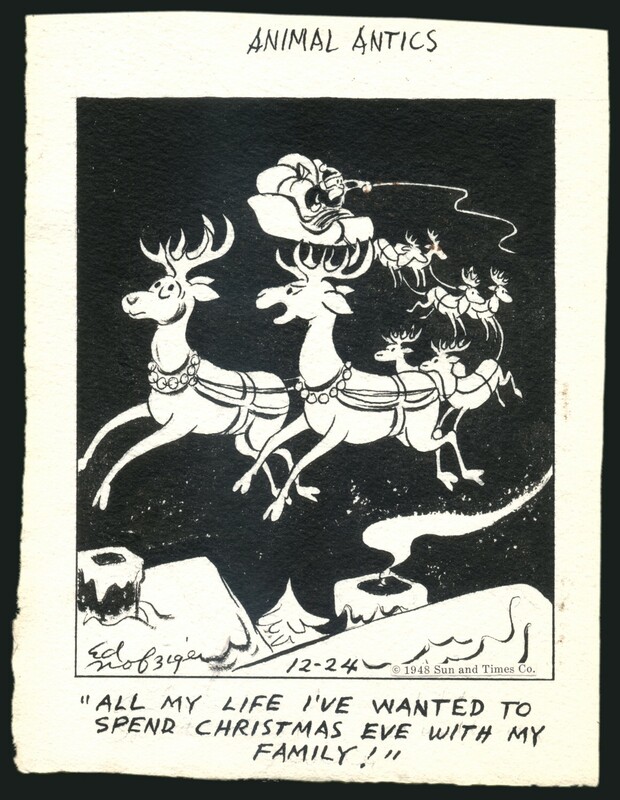 Dated December the 24th (Christmas Eve), 1948, this classic “Christmas Theme” installment is from the strips 2nd year of distribution and features Santa Claus with his sleigh of flying reindeer. Wonderful. Dennis the Menace is a daily syndicated newspaper comic strip originally created, written and illustrated by Hank Ketcham. It debuted on March 12, 1951 in 16 newspapers and was originally distributed by Post-Hall Syndicate. It is now written and drawn by Ketcham’s former assistants, Marcus Hamilton and Ron Ferdinand, and distributed to at least 1,000 newspapers in 48 countries and 19 languages by King Features Syndicate. The inspiration for the comic strip came from Dennis Ketcham, the real life son of Hank Ketcham, who was only four years old when he refused to take a nap and somehow messed up his whole room. Hank tried many possible names for the character, and translated them into rough pencil sketches. But when his studio door flew open and his then-wife Alice, in utter exasperation, exclaimed, “Your son is a menace!”, the “Dennis the Menace” name stuck. Ketcham received the Reuben Award for the strip in 1953. Hank Ketcham retired from the comic strip in 1994, turning the production of the strip over to his assistants Ron Ferdinand and Marcus Hamilton. They continued it as a “zombie strip” after Ketcham’s death in 2001, and they still produce it to this day. This nice two-panel example features full-figure images of Dennis and Gina in each. NOTE: In the comic-strip business, a zombie strip is one whose creator has died (or retired), but which continues in publication. The strips are taken over by others, often relatives or assistants of the originator. The Family Circus (originally The Family Circle) is a syndicated comic strip created by cartoonist Bil Keane (October 5, 1922 – November 8, 2011) and currently drawn and written by his son, Jeff Keane. 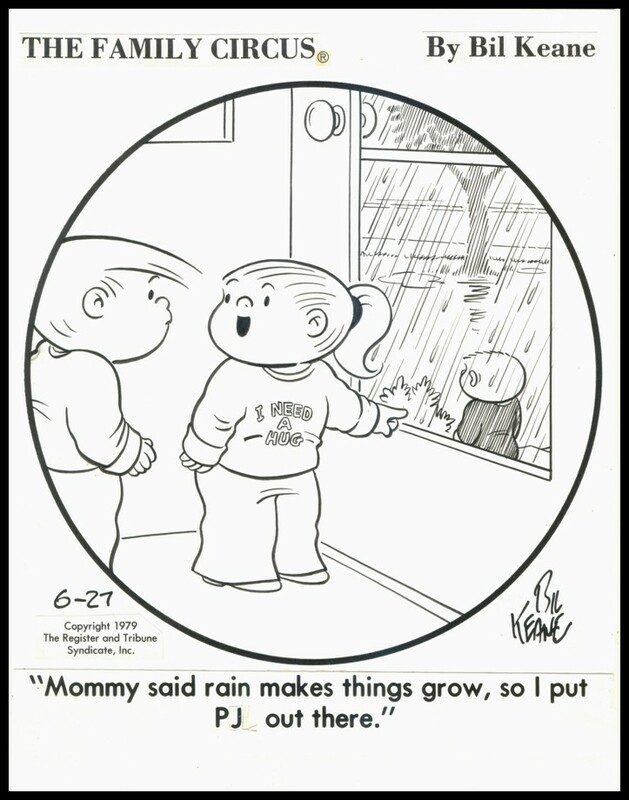 The strip generally uses a single captioned panel with a round border, hence the original name of the series, which was changed following objections from the magazine Family Circle. The series, now appearing in 1,500 newspapers, debuted on February 29, 1960, and has been in continuous production ever since. In 1982, the National Cartoonists’ Society bestowed its Reuben Award on Bil Keane, designating him Cartoonist of the Year. This humorous daily panel features Billy, Dolly, and PJ. 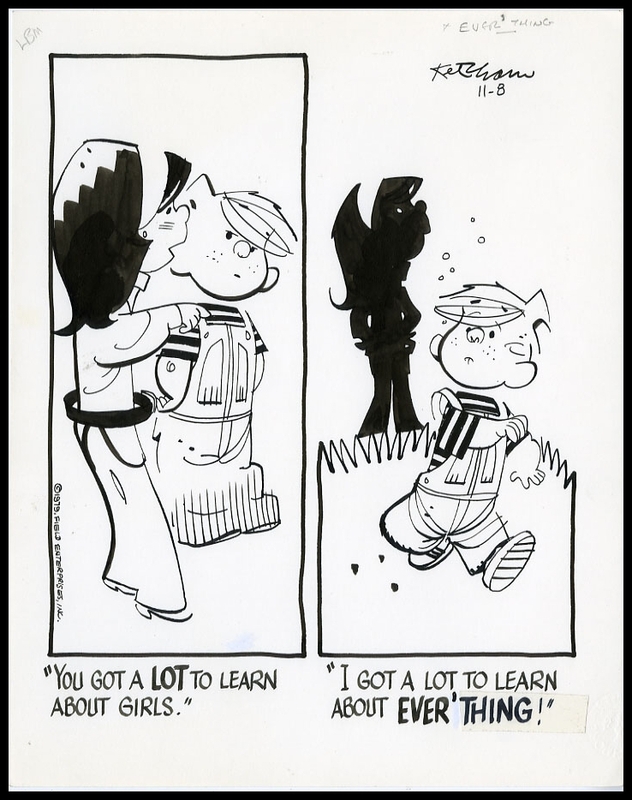 as rendered by the strips original creator Bil Keane.